Shumai (Pork Dumpling) is a type of traditional Chinese dumpling served as dim sum. 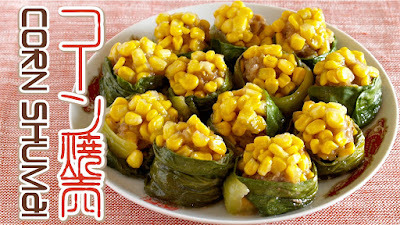 In this tutorial I will show you how to make it WITHOUT using Shumai wrappers but bok choy (a type of Chinese cabbage) and with a lot of corn toppings. yummy!!! 1. Defrost frozen corn kernels and coat with corn or potato starch. 2. Trim off the bok choy stem end, separate out the leaves, and rinse under running water to remove sands. Place them on a microwavable dish, cover with plastic wrap, then microwave at 600 watts for 2 minutes until a bit tender. 3. Place ground pork and A in a bowl and mix well with your hands until the mixture becomes sticky. Divide it in to 12 pieces and roll into balls. 4. Coat with the corn kernels and wrap with bok choy leaves. 5. Place them on a microwavable dish, cover with plastic wrap, then cook in the microwave at 600 watts for 7 minutes.